–(BUSINESS WIRE)–Thanks to Fleischmann’s, there’s something new to love about baking – recipes that let you and your favorite someone bake together. After all, why do something alone when you can share the experience with another? These two-person pizza recipes – from classic pepperoni to summertime favorites like pesto and tomato – bring hundreds of variations to the American favorite. Recruit your favorite person and make a pizza you both will love! Visit www.PizzaCrustYeast.com for recipe ideas, or try the delicious Date Pancetta and Camembert Flat Bread listed below. Baker A places pizza stone on lowest rack in oven and preheats oven to 500°F while Baker B gathers ingredients, mixing bowl, measuring spoons and cups, cutting board, and a wooden spoon for stirring . Baker B continues with prep cutting up pancetta, slicing shallots, snipping dates and slicing cheese. Baker A combines 1 cup all-purpose flour, cake flour, undissolved yeast, sugar and salt in a bowl while Baker B heats water until very warm (120° to 130°F) and then adds water to the flour mixture. Baker A mixes dough until well blended, about 1 minute while Baker B measures remaining flour. Baker A gradually adds enough remaining flour to make a soft dough. Dough should form a ball and will be slightly sticky. Baker A and Baker B take turns kneading** on a floured surface, adding additional flour if necessary, until smooth and elastic, about 4 minutes. Baker A divides dough into 8 equal portions, covering dough (to prevent drying) while working with individual portions. Roll one portion of dough on floured surface into a 12 x 4-inch rectangle. The dough should be extremely thin at this point. Baker B cooks pancetta in a large skillet over medium-high heat for 2 to 3 minutes. Add shallots and cook 5 to 7 minutes or until shallots are caramelized. Remove from skillet and drain on paper towels. Baker A places flat bread on a well-floured or cornmeal-dusted pizza peel, flat baking sheet OR back side of a jelly roll pan. Parchment paper (not waxed paper) can also be used. Make sure that the flat bread moves freely. Baker A continues to roll out flat breads while Baker B sprinkles 1/4th of pancetta mixture over one flat bread. 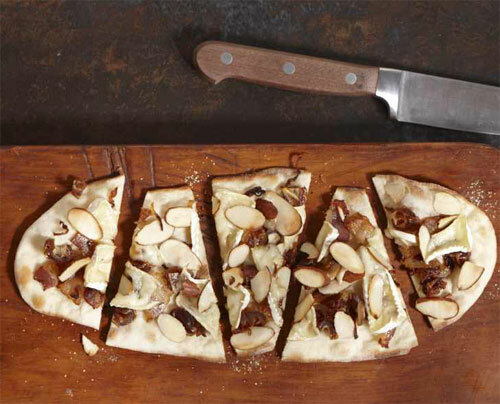 Top with 1/4 cup dates, 1 ounce of Camembert cheese and 2 tablespoons almonds. Repeat on additional three flat breads; you will have 4 flat breads left over. To bake, Baker A slides the flat bread off the pizza peel or baking sheet onto the preheated stone that is in the oven. Use a long-handled spatula to help transfer the flat bread if needed. Bake 3 to 5 minutes or until crust is lightly browned. When the flat bread is done, Baker B removes it from the oven with a pizza peel. You can also use a spatula or tongs to gently transfer the flat bread to a cutting board, pizza pan or baking sheet for serving. Repeat with remaining dough portions. Any unused dough can be stored in the freezer for later use; wrap each portion individually in plastic wrap. Store up to 2 weeks in freezer. Thaw at room temperature about 20 minutes or in refrigerator about 1 hour. This flat bread pairs well with a Rioja wine. **To knead the dough, add just enough flour to the dough and your hands to keep the dough from sticking. Flatten dough and fold it toward you. Using the heels of your hands, push the dough away with a rolling motion. Rotate dough a quarter turn and repeat the “fold, push and turn” steps. Keep kneading the dough until it is smooth and elastic. Use a little more flour if dough becomes too sticky, always working the flour into the ball of the dough.